Twitter does a great job at hiding some of its most powerful tools, such as advanced search and analytics. In fact, if you perform a search for “Twitter analytics,” chances are you will find loads of third party apps at the top of the search results and links to Twitter Analytics buried in the mix. As someone who uses Twitter on a daily basis, up until recently, I was under the impression that Twitter did not provide analytics for users. There’s no obvious link to it like there is on the top of every Facebook page I manage, so I ended up stumbling across Twitter’s analytics section on accident. Now I plan on stumbling by on a regular basis because Twitter Analytics are pretty amazing. From your Twitter account, Twitter Analytics be accessed by clicking on the settings gear shift at the top right of your page and clicking on “Twitter Ads.” This opens a new tab/browser window displaying your ad campaign dashboard. Now, if you aren’t running ads, this can be confusing and chances are, you’d naturally leave this page. But this section can be a goldmine to your Twitter account. Just click on the Analytics tab and make a selection to view analytics. The first thing to check out is your tweet activity. This is where you can view your mentions, follows and unfollows. You can also download this in a CSV file. Beyond the basic tweet and follow/unfollow information is a section you should be checking regularly. If you are familiar with Facebook insights, this section should look a bit familiar. Twitter breaks your tweets into three categories: best, good and all to show you which tweets performed the best, as well as how all of your tweets compare. Also shown are which tweets were marked as favorites, which were re-tweeted and which ones received replies. This is a great way to see what content is most engaging to your followers and can help you tailor future tweets to be popular as well. This section of Twitter Analytics shows your follower base over a period of about the past 6 months. This is a great way to track your success in growing your audience and to set benchmarks in your monthly social media review. 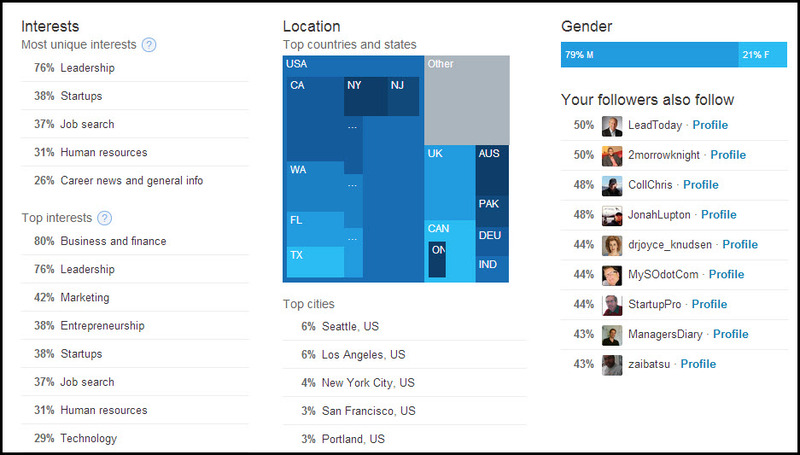 Additionally, your follower analytics provide insights as to who your follower base is by interests, location and gender. It also shows top accounts of those your followers also follow. This information can really help you cater your tweets to suit your followers’ interest or help you find new topics to expand your follower base. Twitter Analytics also allows you to add a website to provide real-time information on traffic from your Twitter account to your website(s). Adding a website: click Add Website and follow the instructions (copy meta code & paste it into your website); enter the domain you want to add then verify the site. Viewing web metrics: click on the website URL from the websites list to access metrics for that website. The graph shows traffic to your site during the period you specify and you can view engagement by day or hour. 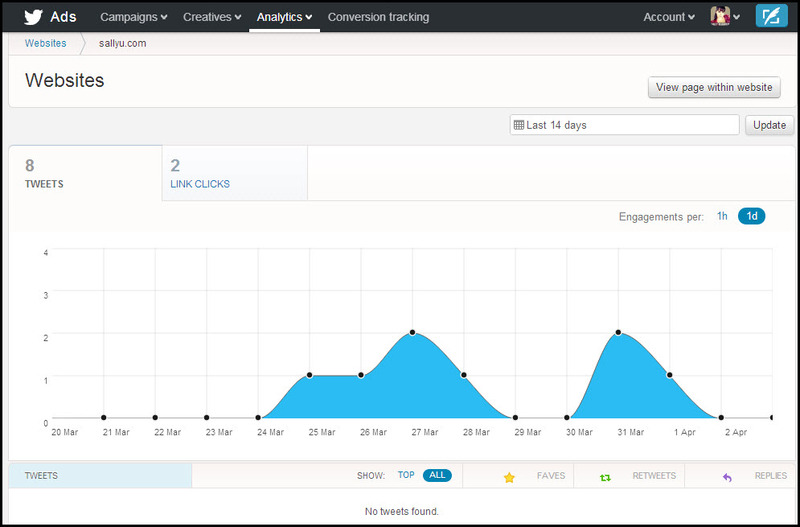 Select Tweets or Link clicks to view statistics for both in the graph. Below the graph are tweets that contain links to your domain. As viewed in my example above, you can see none show up, so that is definitely something I should make sure I focus on adding to my tweets. If there were tweets showing below my graph, I would have the same access and statistics for them as I do for my account analytics, showing which are top tweets as well as those that were favorited, re-tweeted and replied to. So I’ve shown you how to access your Twitter analytics, now what? Make sure you’re reviewing your analytics on a regular basis. Use these hashtags, topics and keywords (only if relevant) in future tweets. Review your analytics of these tweets to see how popular they are. In reviewing my stats, I found that if I used a specific hashtag, that another account would re-tweet my tweet to it’s 2,000+ followers nearly every single time. So knowing this, if the content I want to share is relevant to that hashtag, I make sure to use it for that added exposure. Why Twitter has decided to hide account analytics so well from its users, I have no idea. It is an amazing tool that anyone managing a Twitter account should access on a regular basis and it’s FREE. Just make sure you’re using this resource on a regular basis to find patterns and develop a strategy that works for your account so you can feel the power of your tweets. Previous Previous post: Poll: Which Social Media Site(s) Does Your Business Use? Next Next post: Poll: Is It Acceptable for Managers to be Late?